What better way to celebrate my birthday than publishing a new recipe? 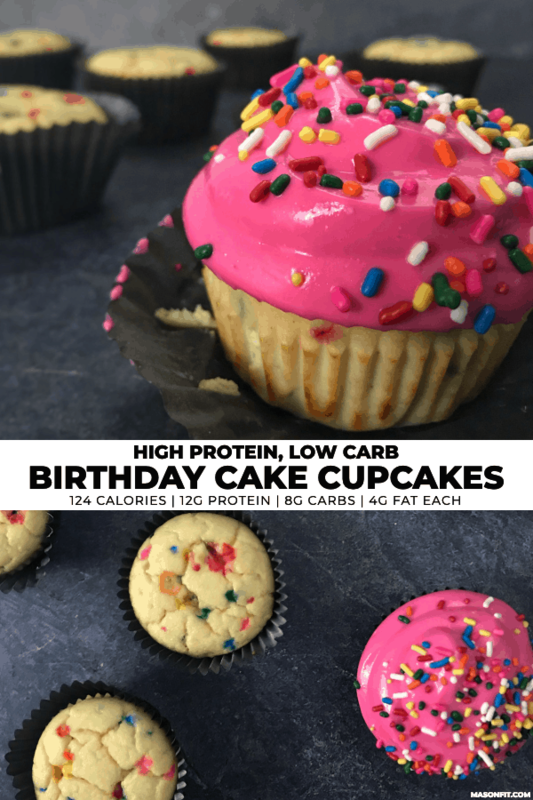 Especially one as tasty as these birthday cake protein cupcakes. It may have taken six test batches, but I’ve finally nailed down one of the tastiest birthday cake protein cupcakes I’ve ever tasted. There’s the perfect amount of structure that you’d expect from a cupcake without being super dry like protein cupcakes tend to be. And thanks for the trusty confetti sprinkle, these cupcakes are s’fun! 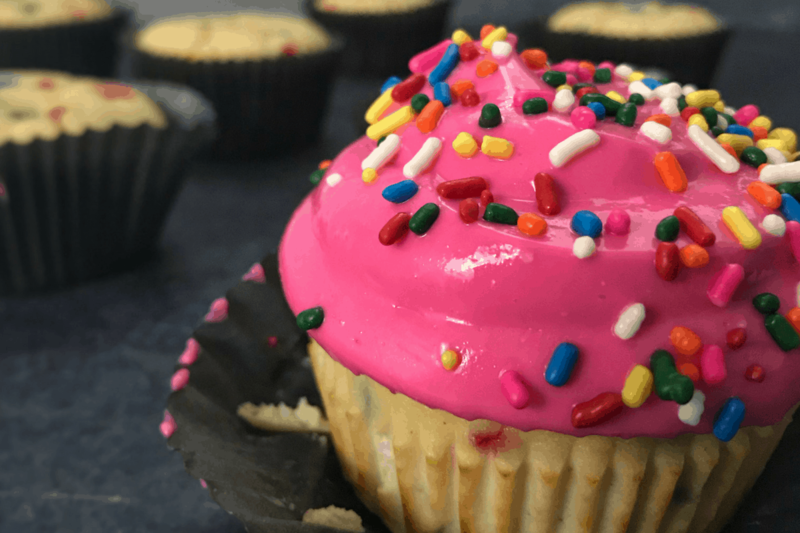 The flavor and texture of these protein cupcakes is only rivaled by their nutrition facts. Without frosting (I’ll give you a few options for frosting), each cupcake has roughly 9 grams of protein, 7 grams of carbs, and 4 grams of fat. Any cupcake with more protein than carbs should not be this tasty and fluffy. If it’s acceptable to toot my own horn on my birthday, I’d like to exercise that right to the fullest. As I mentioned above, I tested and retested this recipe about six times. That means if you have a question about ingredient modifications, I’ve probably tried it. To keep fat and calories under control in a lot of my recipes, I use apple sauce or pumpkin (in chocolate recipes). In this recipe, I started with using both light butter and apple sauce but found the amount of apple sauce needed had too much apple flavor. It’s easy to mask subtle flavors like apple in chocolate recipes, but vanilla recipes need a bit more touch. So, I decided to go with the ol’ faithful egg. If you wanted to swap apple sauce for some of the light butter and/or egg, it will work. Just know you’ll likely taste some apple. If you’re new to my recipes, I use coconut flour a ton. It’s a super ingredient in my eyes due to its absorbency. You save a ton of carbs and calories since you don’t need much to give baked goods structure. In this recipe’s early versions, I used coconut flour exclusively. But similar to the apple sauce, coconut flour gave off a little coconut flavor that took away from the birthday cake-ness of these protein cupcakes. Adding the all purpose flour gave them the remaining cake texture and structure without any real flavor changes. If you wanted to go coconut flour only, try adding 1/4 cup (28g) coconut flour in place of the 1/2 cup of all purpose flour. I always recommend a whey concentrate or blend of whey protein for baking. They’re typically not as lean as a whey isolate or other isolate proteins, but the small difference in calories and fat content goes a long way in baking. In this recipe, I used the vanilla cupcake flavor of Dymatize 100% Whey which is my go-to for all my recipes. I’m not affiliated with Dymatize, their protein simply tastes amazing and bakes really well. That said, you can use any protein powder you’d like. If you’re using a plant-based protein powder or an isolate protein, you may want to pull back on the amount used (maybe 2.5 scoops instead of 3) and add 2 tablespoons of all purpose flour to avoid dry cupcakes. You could also add another tablespoon of light butter or another egg. OR you could just make it as-is. There’s a good chance the cupcakes turn out fine. I just wanted to give you a few troubleshooting ideas ahead of time. Update 3/2019: I’ve added notes to the recipe card below for using Bowmar Nutrition protein powder. 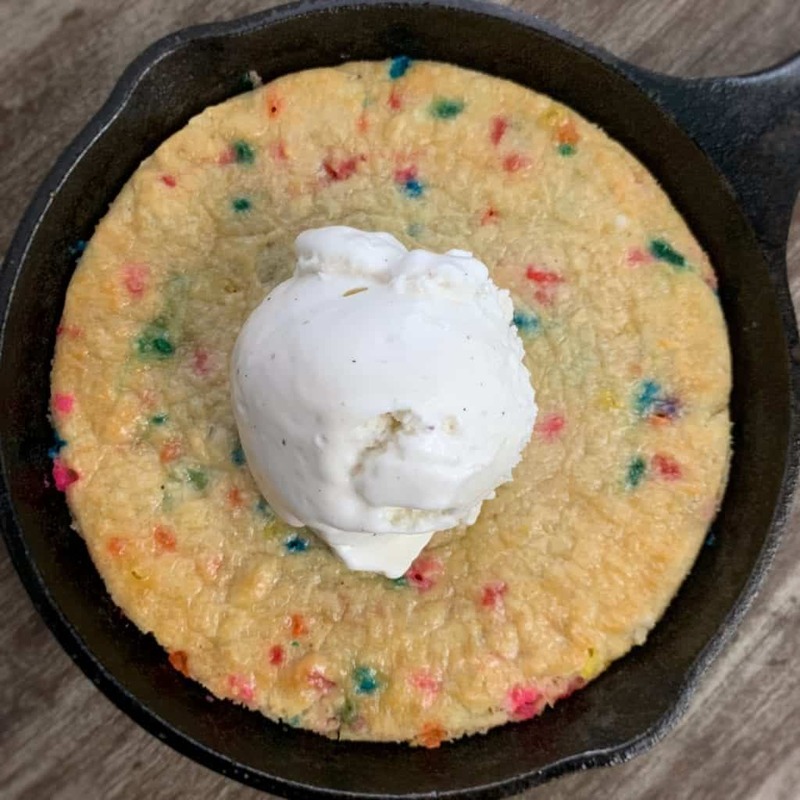 If you’re unfamiliar, I’ve since inked a deal as a Bowmar athlete and use their protein powder to make my current recipes like the birthday cake low carb skillet cookie. That’s it. As you can see in the image below, this frosting is on the creamy/moist end of the frosting spectrum. If you wanted a more traditional frosting, you could use something like Swerve confectioners (a calorie free sugar substitute). For examples, check out my chocolate cinnamon rolls or microwavable protein birthday cake recipes. I think that’s all I have for you on ingredient swaps and recipe modifications. Below you’ll find the full recipe. If you try these protein cupcakes, take a pic and tag me in your creation on Instagram. I’ll be sure to share it with everyone. 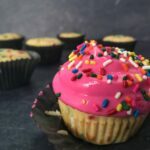 Protein cupcakes perfect for birthdays, parties, or just everyday funzies. Preheat an oven to 325F and line a 12-muffin tin with cupcake liners or baking cups. Mix the dry ingredients in a large bowl and be sure to get any clumps of coconut flour completely incorporated. Gradually add the milk, yogurt, butter, and egg to the dry ingredients. Stir until smooth. Fold the sprinkles into the cupcake batter. Transfer the batter to the cupcake liners as evenly as possible. Each liner should be around 3/4 full. Bake for 20-22 minutes or until a toothpick comes out clean. Avoid overcooking as protein treats run a higher risk of being dry/tough with overcooking. Remove the cupcake liners from the muffin tin to cool. For Bowmar Nutrition Protein Birthday Cake, use 4 scoops (112g) and half the Greek yogurt (1/4 C or 56 grams). Keep everything else the same. The frosting ingredient amounts makes enough for a thinner layer of frosting. If you'd like more frosting, simply double the frosting ingredients. If you wanted to go coconut flour only, try adding 1/4 cup (28g) coconut flour in place of the 1/2 cup of all purpose flour. The fat sources for these protein cupcakes (eggs and light butter) are more or less interchangeable with replacements like unsweetened apple sauce. If you'd like to reduce the fat/calories or need a dairy-free option, try replacing portions with alternative fat replacements. 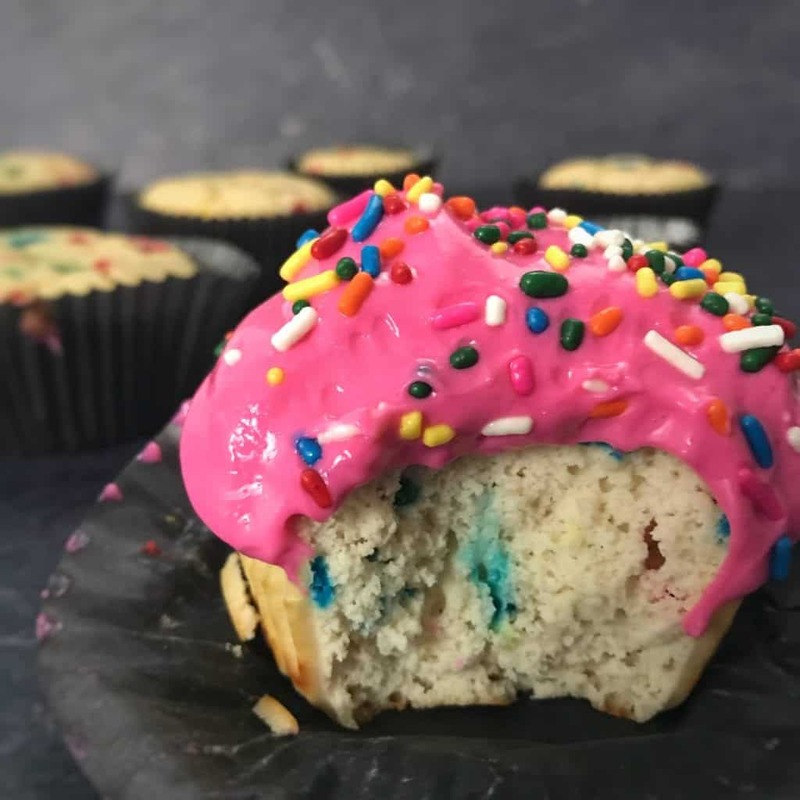 If you’re using Bowmar Nutrition PBC, you’ll definitely want to try the birthday mug cake below (recipe is in the caption). 🧁4-Ingredient Protein Birthday Mug Cake ⠀ 220 Calories | 25P | 10C | 8F ⠀ * 1 scoop (28g) @bowmar_nutrition Protein Birthday Cake * 1 Tbsp (8g) All Purpose Flour * 1 Tbsp (14g) @landolakesktchn Light Butter (50 cals/tablespoon) * 2 Tbsp (28g) Vanilla Fat Free Greek Yogurt ⠀ 1. Mix everything together (you can microwave the butter for 5-10 seconds for easy mixing) and transfer to a separate mug, small bowl, or ramekin sprayed with a bit of nonstick spray. 2. Microwave for 45-60 seconds. The size of your bowl/mug will affect cook time. So keep an eye on it and don’t turn it into rubber, k? ⠀ Note: I won’t judge you for adding some extra spranks. With mug cakes and microwave recipes, ingredient swaps can be unforgiving. I’d suggest trying another recipe before making too many changes. I have a couple birthday mug cakes on @mugsformuscles and one on my site. Google my name and birthday cake and you’ll come across them. ⠀ And if you haven’t tried any @bowmar_nutrition products yet, get it together. You can click the link in my bio and click on this post or go to bowmarnutrition.com/mason to get ya life right. Loved these so much!! One of the easier things to make out of ingredients that you most likely already have at home. Got me through weeks of prep, and are actually quite filling! I am the owner of Tonicity Fit Personal Training Studio in West Chester, PA. 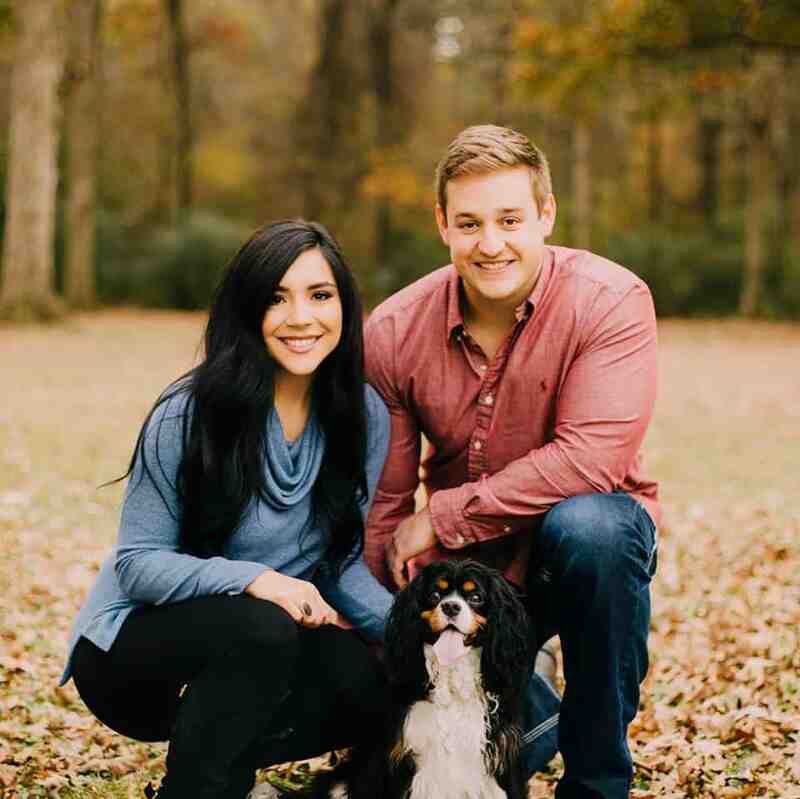 I have used your recipe for many of my clients to help them get through tempting events where the food choices are otherwise unforgiving to the waistline. Would you mind if I use your recipe in my next blog post? I will absolutely give all of the credit to you in my post! Omg I love these!!! They were so tasty and so cute! I love that you can have 1 or 2 and not feel bad. I made these with my friend on one random Sunday afternoon and everyone loved them! I followed the recipe as is except for the protein powder I did a mix of vanilla protein and Cold Stone birthday cake remix protein! 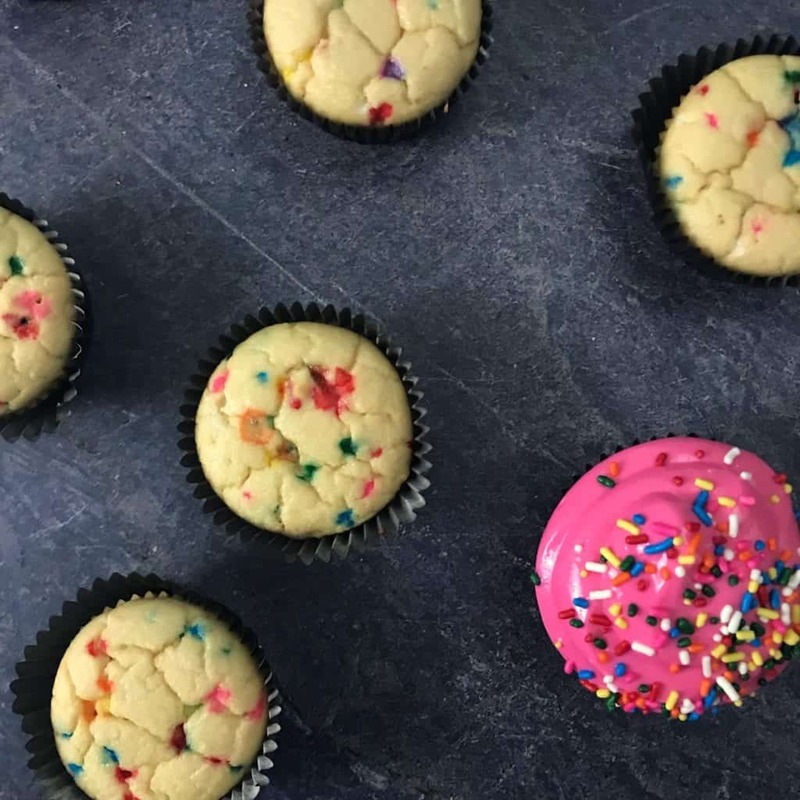 As an avid baker who brings cupcakes to her friends on the regular but refuses to eat her own normal people recipes (#fitlife), these protein cupcakes swooped in and changed the game for me. Used all coconut flour rather than the two different ones, did some math, reduced the recipe down to a single serving, and I’ve got myself a beautiful little cupcake that looks just like the ones I bring to my friends (except totally guilt free! ).